The following short story illustrates the benefits of using a mascot-centric approach to school climate creation. You'll be glad you took 60 seconds to read it. This story is a glorious example of how a mascot-centric culture helps students navigate through social situations with greater success. This is the essence of what we mean by creating a mascot-centric climate for your school. It’s a way of life, a welcoming world full of positive examples. No matter what your mascot is, we can help you build a mascot-centric climate full of positive behavior examples that students whole-heartedly embrace, imitate and use to develop social skills to help them navigate through school, and life, with greater ease and success. The instant a child utters the words "I am a tiger," something almost magical happens. It is a powerful affirmation that actually molds part of their self-image. They ARE a tiger! And what makes it magical is that it's human nature to act consistently with one's self-image. Even if their mind is full of contrary information and behavioral examples, the gravitational pull is relentless, and that gives educators an excellent opportunity to influence their behavior. Control the tiger, and you control the child. In one sense, by owning the tiger (mascot), you own very valuable real estate in the child's mind - a part of their self-image. The emotional incentives for enjoying success inside the community of tigers is very powerful. Everyone wants to have friends, be liked, and enjoy the benefits of a supportive social circle. A mascot-centric climate leverages the school mascot as a role model to demonstrate the positive behaviors of your PBIS program. It gives students a framework for understanding the social and behavioral expectations of the community. The framework is visual (tiger), so it's easy to understand, and it's also very enticing and engaging. Quite simply - It works... beautifully! 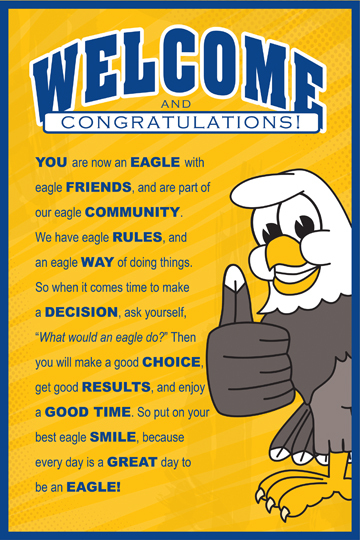 For PBIS schools - This welcome message refers to rules/expectations and tells students how to make good decisions.